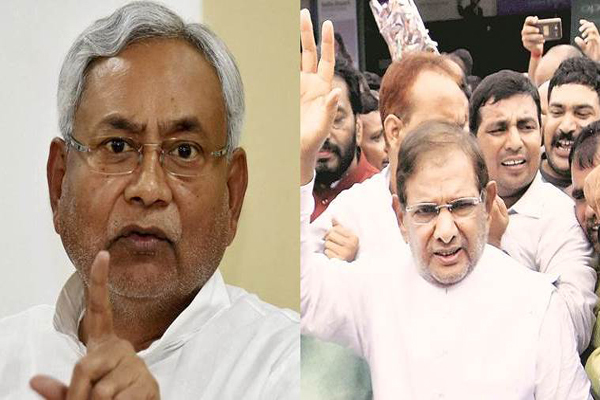 Patna (PTI): Supporters of rival JD(U) factions headed by Nitish Kumar and Sharad Yadav clashed outside the residence of the Bihar chief minister here today, police said. Riding two-wheelers without helmets, Yadav’s supporters were escorting him from the airport to the S K Memorial Hall, the venue of their Jan Adalat programme, when they stopped outside the chief minister’s residence on the way and shouted slogans. The clashes took place when some of them carrying sticks and belts tried to enter Nitish Kumar’s 1, Anne Marg residence — opposite the Raj Bhavan. Soon, Kumar’s supporters, who had gathered there for (JD (U) National Executive Committee meeting came out and chased away Yadav’s supporters, police said. Patna Senior Superintendent of Police (SSP) Manu Maharaj who reached the chief minister’s house on hearing of the trouble, told reporters that a probe would be conducted and the guilty would be punished. “We will watch CCTV cameras and try to identify those behind the violence and act against them,” the SSP said. Asked about security arrangements and why Yadav was allowed to take that route, the SSP said the concerns would be part of the probe. Parallel meetings were held here by the rival JD(U) factions headed by Kumar and Yadav. While the JD(U) national executive committee met at the chief minister’s residence, the rival camp held its Jan Adalat in S K Memorial Hall. Yadav, Ali Anwar and suspended former Bihar minister Ramai Ram were prominent figures at the Jan Adalat programme. The two JD(U) leaders fell out after Nitish Kumar broke the Grand Alliance with the RJD and the Congress in Bihar and joined hands with the BJP.